3300 COUNTRY ROAD -BEGINNERS OIL PAINTING ART DVD (Oil) 102 minutes [Very Popular DVD]. This is an excellent beginner video to get you started in learning to paint with Oil Paints! In this DVD Jerry Yarnell uses the wonderful new Grumbacher Max Oil paints. Grumbacher's Max Oil Colors are identical to conventional oil colors, with one major difference — Max Oils thin and clean up with water. With Max Oils, there is no need for special brush cleaners, turpentine, or mineral spirits. In this DVD Jerry takes you step by step in setting up your palette and oil paints, explaining what brushes to use to achieve different effects, and even shows how to clean your brushes. 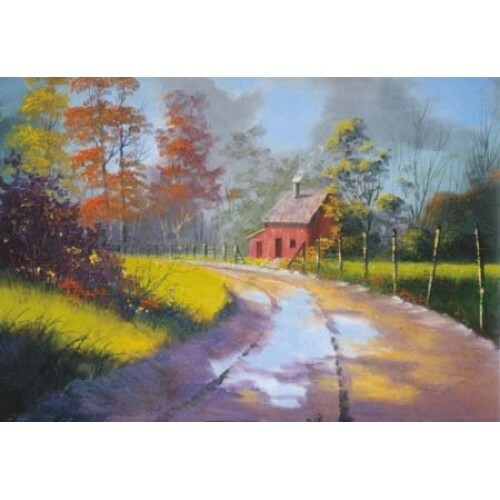 As an added bonus Master Artist Jerry Yarnell guides you step by step through the painting of this beautiful Country Road and farm house landscape scene.